When anyone talks about the greatest poker players of all time, Stu Ungar’s name will shine immediately. He is considered by many to be the greatest No Limit Hold’em player of all time. He was born and raised in New York city. 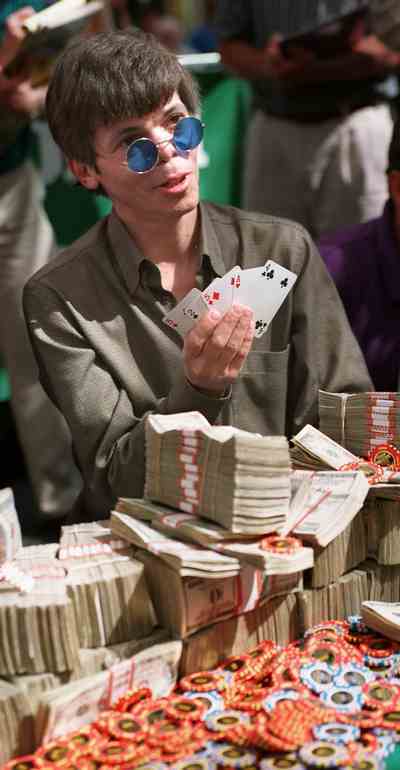 Stu Ungar, known as “The Kid” is a three-time World Champion (with five WSOP bracelets). Ungar won ten major No Limit Hold’em championship events (in which the buy-ins were $5,000 or higher). His father was a bookie and gambler himself. T.J. Cloutier (all-time leading money winner at the WSOP) and Johnny Chan (two-time World Champion), have won half that many. Amazingly, Ungar only played in about 30 of these championship events in his life! To further understand Stu Ungar’s greatness, think about this: For years, the second largest poker tournament in the world was Amarillo Slim’s Super Bowl of Poker. At that time, every great poker player attended Slim’s tournaments. Like the WSOP, the main event at the Super Bowl of Poker was a $10,000 buy-in No Limit Hold’em championship. Only one man in history captured titles at both the WSOP and the Super Bowl of Poker, and that man was Stu Ungar. And he won them three times each! At 15 he dropped out of school when a well known bookie staked Stu to the $500 buy-in in a big gin rummy tournament. He won $10,000 but lost most of it on horses in one week. Stuey’s main two problem were his drug abuse and sports betting. “High Roller, The Stu Ungar Story”, is the movie based on Stu Ungar’s life. Definitly worth having it in your poker movie collection. You can also read a review on the movie in the poker movies section. “The Man Behind The Shades” – The Rise and Fall of Stuey the Kid – is the book by Nolan Dalla based on Ungar’s life. Ungar was (and has been) the greatest Gin Rummy player of all times. At age 10 in 1963, he won his first gin rummy tournament in a Catskill Mountain Resort while vacationing with his parents. Ungar never had a job in his life. He was always a high stake gambler. Ungar’s daughter Stefanie, who considers herself to be anti-drugs, called out the famous words “Shuffle Up and Deal!” at the 2005 World Series of Poker. Stu Ungar died in Novermber 22nd, 1998 at Oasis Motel, 1731 S. Las Vegas Blvd. He was 42 at the time and died of drug overdoes. There wasn’t only one drug that could account for the death Stuey. There were cocaine, methadone and the pain-killer Percodan in his system.